Interview with Adam Smith | Whatis Series...? Recently, I had the pleasure of interviewing psychometrics genius and Hobnob enthusiast, Adam Smith about his title for our What is …? Series, ‘What are PROMs?’. Adam is a Chartered Psychologist and Associate Fellow of the British Psychological Society, and holds a PHD in psychometrics. 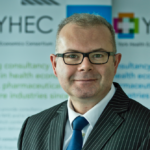 He supports the York Health Economics Consortium (YHEC) outcomes research, working with the design, development and testing of PROMs and ePROMs. He has a vast knowledge of PROs, with experience across several settings from research and pharmaceutical, to academic and consultancy environments. Previously, Adam has worked as a lecturer in quantitative methods at the University of Leeds and as a principal scientist at Cancer Research UK. On approaching Adam regarding this interview, he was only too happy to work with us to answer some of the questions, you, the reader, may have about PROMs. Below, we share the insightful conversation I had with Adam about his article and provide the answers to those questions you are just itching to know. Annabel: Thank you for agreeing to speak with me today Adam. We are here to discuss your article ‘What are PROMs?’, which explains what patient reported outcome measures are, the different types that are used, their psychometric properties and concludes with the new development of ePROMs. As an author of our What is …? Series, I would like to ask you a few questions about your article in order to share your perceptions on this with our readers. So first of all, please can you explain what the take home message of your article is? Adam: I guess the take home message is really all about capturing the patient’s voice, so whether it’s in clinical trials or clinical practice, there is often the focus, quite rightly on treating a disease or the condition, and, therefore, picking up the clinical parameters around that. But, increasingly I think there’s a growing awareness that we also need to capture the patients experience, the patients voice in this process. That way, we can determine or assess the impact of the treatments for disease from the patient’s own perspective and we do that through patient reported outcome measures. These are validated instruments, not survey instruments, they are properly validated, scientifically-based instruments and are valid, reliable and robust. Annabel: So thinking about patient perspective as a measurement for the effects of treatments, do you think as well that with PROMs gaining more prominence in the clinical field, this is because patient views are actually more valued now? Adam: Yes I think that’s right, I think we’ve moved away, or we are moving away from perhaps a more paternalistic approach to patients, to involving patients more and more in the decision making processes and PROMs play a prominent role in that. Annabel: That’s great, so I think this leads us to the next question – how willing are patients to partake in PROMs? Adam: Ah, that’s a difficult question to answer *laughs*. From personal experience, the vast majority of patients will quite happily complete a PRO, but you’re always going to get some people who will complete it and then don’t want to have anything else to do with it. To take an example from the NHS, they have a programme where the completion of a PRO is mandated for particular interventions, for example, hip and knee replacement, varicose veins and hernia repair, and patients complete the PRO before they are able to go for surgery and then after surgery, maybe three or four months after. So just to take some numbers from that, hundreds of thousands of patients have actually completed PROs just as part of that particular programme, and then do so on an annual basis, so I guess that gives you some idea of how willing patients are to complete PROs. Annabel: So when you were saying it’s mandated by the NHS, how do they… I don’t mean do they force the patients to do it *laughs*, but how do they get that compliance? Adam: That’s a very good question, obviously the patients are at liberty, I mean I don’t know the exact mechanics of it, but I imagine that it’s informed consent so they can refuse to complete the questionnaires or the PRO, should they wish to. But obviously, going by the numbers, most patients are quite happy to do it. Annabel: …It’s just that I love filling in these sorts of forms and the more information that I can put down on a form the better, but I know that some people are different…there’s a mistrust isn’t there sometimes with what people think is going to happen. Adam: Exactly, yes, but I used to work for Cancer Research UK, and we routinely collected PRO information from cancer patients in clinic and on the wards, and I’d say 80–90%, if not more, of those patients were very willing to complete PROs. Even if it’s just to contribute towards the information they’re providing that may help other patients. Annabel: Yes definitely, and that’s quite a good figure, I know there’s 10–20% who aren’t, but you can make some good scientific analogies I think with that sort of number. Anyway, moving on to our next question. Do you feel that patient’s needs are being met well enough based on the information from PROMs? Adam: Hmmm, it’s one of those things, that, a well-designed PROM should capture all the information about the patient’s condition or their treatment or intervention. The question then is, what do the doctors, the physicians, surgeons, what do they do with that information? I think this is where you potentially get a problem, because doctors are used to clinical parameters, so they know what your oxygen saturation levels should be, they know what your glucose levels should be because they’ve got national, international statistics to back that up. But, often enough if you have a score on a PRO they might not know what that means. So what we need to do as developers of PROs is to facilitate the interpretation of the scores, so that a clinician reading a PRO or a change in a PRO score, will have an indication of what that means to the patient and I think that’s probably where the next steps lie in terms of PRO development… it’s trying to enable clinicians to use PROs in their clinical practice, on the basis of a scientific database basically. Annabel: Do you know the percentages of clinicians who are using them…do all of them use them, or is it just a percentage? Adam: I think it’s very patchy, so to go back to my example of Cancer Research UK, PROs are quite well established within that particular unit, this is at Leeds St James hospital, but around the country it’s down to individual clinicians and how they value the information that PROs provide. If we look at the NHS programme, like at the moment, as far as I’m aware, the data is being used at a national level, partly as an indicator of hospital performance, but I don’t know whether it is being used at the micro level or whether it is being used by individual surgeons to help in their clinical practice. Annabel: Do you have champions of certain PROMs, so if a certain clinician has had a great experience with them they would then go and tell their friends, I guess, at a conference to show the benefits? Adam: Yes, I think so, but I think it’s one of those things that if you go back a couple of decades, they started to teach student doctors communication skills because they realised that it wasn’t good enough just to have clinical skills, they also needed to be able to communicate with patients and I think the next step in that process is then, not just a communication process, because it’s also to try and capture more of the patient experience, so the next step is then to get them to use PROs. And yes, there will be individual champions out there who are using PROs and who are experiencing the virtues of them, but it is trying to change the mindset of the whole profession that is very much still clinical and laboratory-based. Annabel: …and do you think that’s happening? Adam: Well, I started with PROs in the 1990s and the big thing then was ePROs electronic PROs and that was 20, 30 odd years ago and we are still talking about implementing ePROs twenty years along, so it’s a very slow process trying to convince people. Adam: It’s a huge organisation… and people are naturally worried about what the information is going to reveal. Annabel: Yes of course. To get on to our next question, why is it important to you that PROMs are well understood and implemented? Adam: Well, I think that goes back to what I’ve been saying that PROMs provide a unique perspective of the impact of treatment, or a disease or a condition, from a patient’s perspective. So if you have a PROM that is reliable, valid and robust and is responsive to change, that can pick up changes in the disease, then it provides you with information that you can use alongside clinical information. Annabel: Yes definitely. I also noticed you’ve been using PROs and PROMs interchangeably throughout our discussion and I wondered if you could just explain if there is any difference between them at all? Adam: … there’s a bit of a North Atlantic bias there, so the term PRO originated from the FDA, and so in America they are referred to as PROs. PROMs is very much an English term for it. There’s also a pharmaceutical and public sector bias as well so the term PRO is used primarily in pharmaceutical circles, whereas PROMs is used in the NHS and the public sector. So, it is basically all the same thing. Annabel: Ok brilliant that clears that up, and lastly, if the What is …? Series covered everything about life, what title would you find most useful? Adam: I was going to say what is life all about, *all laugh* what is the meaning of life? Annabel: You can go for a lighter hearted approach, something that we are talking about in our office at the moment, I don’t know if you saw the jaffa cake thing recently about the cake biscuit and the philosophical reasons why it’s one or the other? We were discussing in the office what sort of biscuit or cake we’d be, *all laugh* I don’t know if you know what sort of biscuit or cake you’d be? Adam: *laughs* what sort of biscuit or cake would I be? I quite like carrot cake actually, but ermm what are they called Hobnobs, I love Hobnobs! Annabel: and would you say you are like a carrot cake or a Hobnob? Adam: Hobnob, definitely a Hobnob yeahh, milk chocolate Hobnob, yeahh, I might have to go buy some now! Annabel: *both laugh* ahh sorry! Well on that note, thank you very much for your time today Adam and for giving us all a better understanding of PROMs.